It is very easy to make a soft and flexible cold pack, to keep ready in your freezer, for when someone suffers an ache or injury. OR, maybe you just have huge bags under your eyes from a sleepless night! You know that a cold compress may help, so you pull an ice pack out of your freezer. Then, you just stare at the hard block, wondering how it will possibly conform and mold around the affected area well enough to cool it, without causing additional discomfort. Sound familiar? Fortunately, I learned an easy way to make a soft and flexible cold pack, and I'm happy to share it with you today. Years ago, while my daughter and one of her preschool friends were playing, one of them got injured. 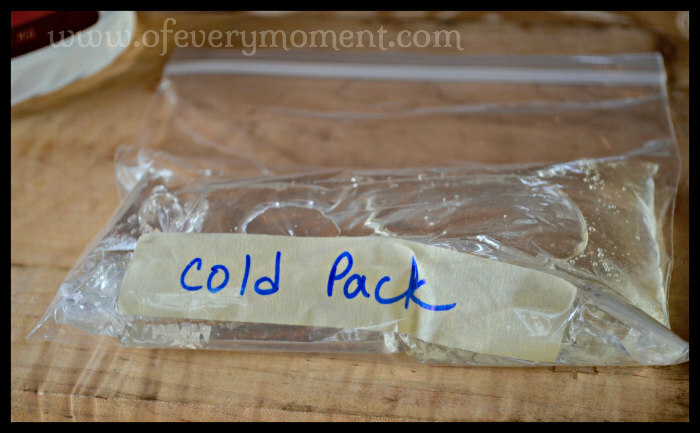 The other child's mother had one of these homemade cold packs in her freezer, and I was really impressed by how well it worked. She told me how to make it, and I 've always kept a few in my freezer ever since. A soft, homemade cold pack can be assembled in just a few minutes, from items you probably already have in your kitchen. It actually took me longer to change the lens on my camera and put in a new memory card, than it did to assemble the ice pack in these photos! Once you make a cold pack, just pop it into your freezer and it will be ready for use as soon as it is sufficiently chilled through. The bag can be refrozen and reused over and over again. Press most of the air out of the bag, 'zip' the seal tightly, and roll the top down so you form a smooth cylinder of the contents. Tape the bag closed and label it so it is not confused with any food items in the freezer. For extra protection against leaks place the filled zip lock bag into a second bag and zip firmly. Freeze until very cold. (Contents will not freeze solid, but will remain a gel-like consistency.) The larger the volume of corn syrup used, the longer it will take to become cold. You can use any size of zip-lock bag to make your cold pack. I find a sandwich bag filled about 1/3 full is perfect for many injuries and aches and pains. If you keep a few of these small cold packs in your freezer, you can rotate them as they warm up and always have a cold one at the ready. Remember that it is never a good idea to apply a cold or ice pack directly to bare skin, so be sure to wrap the bag in a thin cloth or apply it over light clothing. These ingredients are non-toxic, but be sure to occasionally inspect the integrity of the plastic bag, so it doesn't leak and cause a sticky mess. I hope you don't have too many aches and pains - but I think you may find this tip helpful for when you do. Have you ever made a homemade cold pack? Did you make it this way? This is a great idea. I've always wondered if there was a way to make this at home, since water in a bag just freezes into one big block. Thanks for sharing this today! These cold packs need to be refrozen sooner than a block of ice would Lana - but they are soft and squishy, so a lot more comfortable to use! Finally! A way to use up the leftover corn syrup that has been sitting in the pantry for probably 6-7 years now. We bought it for a recipe which we never made again and I can't even remember what it was now. The bottle has been up in the back corner of the top shelf all this time! Perfect. I hope you find a better use for your corn syrup in your freezer than on your pantry shelf ... but that the times you need the cold pack are not many! What a great idea! With my sore joints I can always use a good ice pack. Too bad I can't get one body sized.